The island of Burano, completely accessible, is famous for the ancient art of lace making and the characteristic coloured façades of the houses which make it the most colourful of the islands in the Venice Lagoon. As well as the recommended itinerary, we suggest you simply "lose" yourself among the alleyways, colours and shops of this special place. 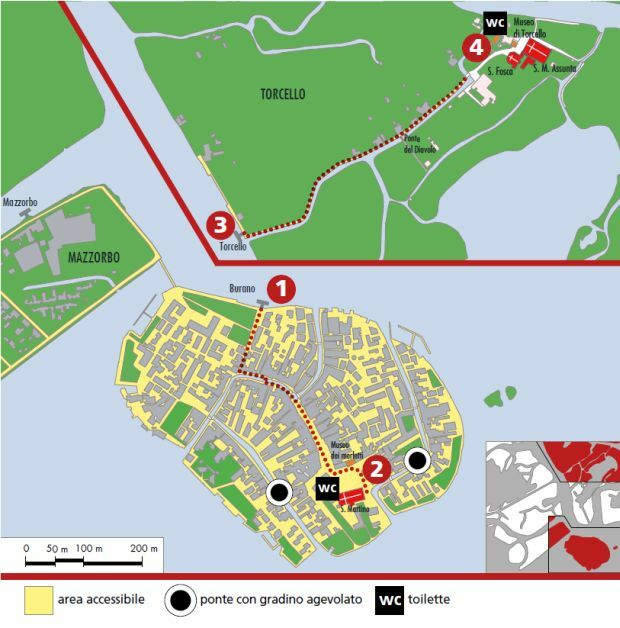 Take the 3 line boat (accessible to one wheelchair at a time) from Piazzale Roma (bus terminus) or Ferrovia (railway station) to the Faro stop on Murano, then take the 12 line boat (accessible to wheelchairs) to Burano. The island can also be reached by the 12 line boat from Punta Sabbioni (on the mainland spit south of Venice). degli Assassini. This brings you to Via Baldassarre Galuppi, the main street dedicated to the 18th century composer (born on the island) lined with restaurants, shops selling lace and Buranelli, delicious S-shaped biscuits. At the end of the street is Piazza Galuppi where you can admire the Church of San Martino and the Lace Museum. The 16th century church houses a number of works of art including The Crucifixion, a painting from G.B. Tiepolo's youthful period. The main entrance to the church, has a low ramp of about 8 cm (3 inches). The Museum is housed in the historic Lace School founded at the end of the 19th century. The displays are accessible, and you can see live demonstrations of the lace workers' techniques (booking required). You can also visit the island of Mazzorbo and enjoy the park by crossing the long ramp linking Burano and Mazzorbo. From the Burano landing stage, take the 9 line boat to Torcello (accessible to wheelchairs). From the landing stage, go along the quayside flanking the canal; on your right you will see Ponte del Diavolo, or the Devil's Bridge, one of the few bridges without parapets. To reach the heart of the island you will need to cross a bridge with five steps (the tread is sufficiently deep to allow someone in a wheelchair to cross the bridge easily with the help of a carer). Attila's Throne, Torcello Museum, the 14th century Church of Santa Fosca and the Cathedral of Santa Maria Assunta with the baptistery ruins. Founded in the 7th century, the cathedral is the oldest church in the Venetian Lagoon. The interior is rich in splendid Byzantine marbles and mosaics. Don't miss the spectacular Last Judgement above the main door. Access to the cathedral is facilitated by ramps. The Torcello Museum is located in two separate buildings: the Palazzo del Consiglio and the Palazzo dell'Archivio. The former houses the medieval and modern section and only the ground floor is accessible. The latter housing the archaeological section can only be reached via a staircase and is not accessible.